To begin, you'll learn to identify the different areas of the File Browser and their uses. Notice the four panes in the File Browser, three on the left and one on the right side of the window. 1 In the upper pane on the left, click the plus sign to expand the Desktop icon. Then continue opening folders down to the Lessons/Lesson02 folder, and select the Digital_Camera_Images folder. 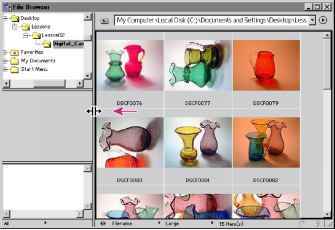 On the right side of the File Browser, thumbnails appear, showing the contents of the Digital_Camera_Images folder. 2 At the bottom of the File Browser, click the arrow after the Large With Rank option to open the View By pop-up menu, and select some of the other commands, one by one. • The Small, Medium, and Large options change the size of the thumbnails. 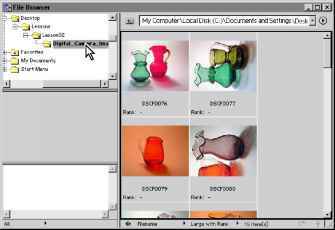 • The Details option displays additional information about the image file. You will work with the Large with Rank option later in this lesson. For now, select the Medium or Large view option. 3 Move the pointer over the vertical bar separating the left and right panes of the File Browser until it appears as double lines with arrows (HI*) , and then drag to resize the panes. 4 Click the Toggle Expanded View button () at the bottom of the browser to hide the three panes on the left. Then click the same button again to bring back the three left panes. 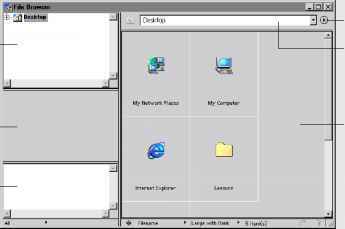 5 On the File Browser palette menu (click the arrow button in the upper right to open the menu), choose Dock to Palette Well. 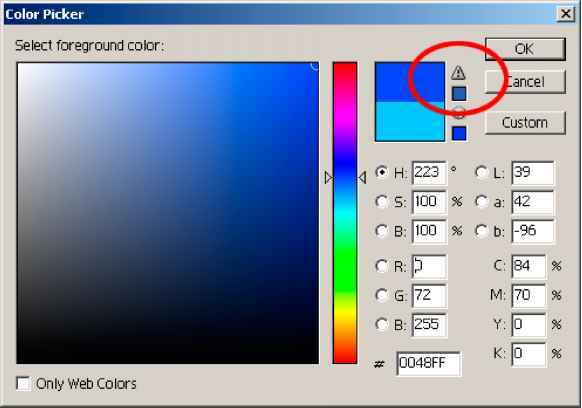 Note: If your screen resolution is 800 pixels x 600 pixels or less, the palette well does not appear. Instead, you can click the Close button on the File Browser or choose File > Close. 6 In the palette well, drag the File Browser tab out again to the center of the work area or, if the File Browser does not appear in the palette well, choose File > Browse.